As the daily newsfeed full of suffering and injustice scrolls by, it's all too easy to question what one person can really do to enact the profound change the world needs. Like moviegoers, we often watch and witness with care but assume the script has already been written. Disruptive Compassion dares to make a bold counter: You possess the power to provoke real and meaningful change. Why? Because God has empowered you to rewrite the story of tomorrow. More than 2,000 years ago, Jesus created a model for revolutionaries that has been followed ever since. These principles are just as powerful to guide our journey today. 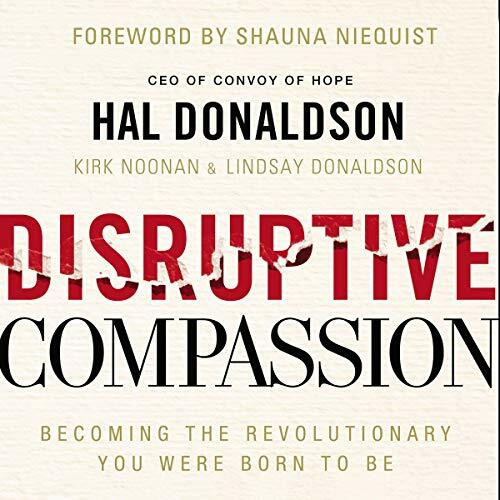 With raw and inspiring stories from the world's most desperate places and his own journey to find meaning, Convoy of Hope founder and CEO Hal Donaldson will take you on a tour along the front lines of courage and compassion. Let this audiobook be your crash course in what it means to become a revolutionary as you learn how to evaluate the resources you already have, navigate real concerns and risks, check your motives, and ultimately become equipped as an agitator with purpose. With principles and insights gleaned from two decades of relief work, Hal reveals what he’s learned from the journey and what we can take with us as we join the revolution. Let Disruptive Compassion be your invitation to move beyond pity, helplessness, and outrage, and let it be your playbook for making a difference right where you are.